The start of Bonaire's sport diving industry can be traced back to a momentous event that took place in the year 1962, with the arrival of Captain Don Stewart. Within a year of his arrival Don had set up the island's first dive operation at Flamingo Beach. 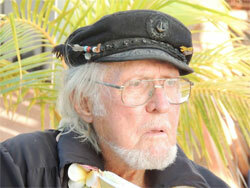 Captain Don was then instrumental in the formation of Bonaire's Marine Park and reef preservation. When arriving in Bonaire, Captain Don wrote in his ship’s log “...looks to be a fantastic underwater island“. Captain Don was right! Today, Bonaire is known universally for world-class diving. In addition, Bonaire is famous for its award winning, easy access shore diving and calm seas make for gentle boat dives. This, coupled with excellent visibility, makes Bonaire a prime destination for scuba certification as well.